With the sale of Hydrotech International's assets, Eco Investor will suspend coverage of Hydrotech until such time as it may have new assets and a business that is environmentally positive. Asset manager the BlackRock Group has become a substantial shareholder in APA Group with a 5 per cent interest. BT/Asgard has closed the Aspen Parks Wholesale Property Fund to new investment on its platforms. The Aspen Parks Wholesale Property Fund invests directly in the Aspen Parks Property Fund, and the closure by BT/Asgard to new investment may result in a decrease of inflows into the Aspen Parks Property Fund, said Aspen Funds Management (AFM). AFM said it understands that "the decision is in no way a reflection on the investment fundamentals of the Fund, which remains one of the top performing unlisted property funds in the sector". "The BT/Asgard platform administrators have indicated that as part of a broader review of their investment menu they have a preference for investment options which have daily liquidity that matches the liquidity of the underlying assets." AFM said it acknowledges the traditionally illiquidity of the property sector, but "the decision in AFM's view is disappointing given the Wholesale Fund has never failed to pay redemption requests since it was launched in March 2008". The decision does not affect the day to day operations of the Aspen Parks Property Fund. Qube Logistics has expanded its regional rail capacity with an agreement to acquire all of the shares of Macarthur Intermodal Shipping Terminal Pty Ltd (MIST). MIST and its operating subsidiaries, Independent Railways of Australia Pty Ltd and Independent Railroad of Australia Pty Ltd, trade as Independent Transport Group (ITG). As part of the transaction, Qube will also acquire the freehold property at Minto, NSW from which ITG operates its rail terminal and warehousing. The total consideration is around $95 million and will be funded from Qube's new syndicated debt facility. The acquisition should be earnings per share accretive in the first full year. The acquisition will expand Qube's rail fleet to 80 locomotives and 800 wagons. Managing director Maurice James said the transaction is important for Qube to expand its logistics solutions for rural commodities. ITG has contracts to move grains and malt by rail from regional NSW to the MIST for export through Port Botany. "Qube believes there is significant potential to build on these relationships to provide competitive, efficient logistics supply chain solutions for major grain companies," said Mr James. The ITG business will be integrated into Qube's Logistics division. If there is no regulatory intervention, the transaction will be completed by the end of July. Infigen Energy is celebrating Global Wind Day by hosting an open day at the Capital Renewable Energy Precinct in NSW. The open day will consist of tours to the Woodlawn Wind Farm and a renewable energy information forum in the Bungendore School of Arts. Infigen's Operations Control Centre operators, wind farm developers and construction project managers will act as tour guides. "This is a great opportunity to see and hear the wind turbines operating up close. We have had hundreds of registrations from different age groups, ranging from a young school age to senior citizens, who all want to visit the wind farm," said Rene Kuypers, manager of the Capital Renewable Energy Precinct. The information forum will cover questions about wind and solar energy, Infigen's Capital and Woodlawn wind farms and proposed solar projects. The forum is open to all visitors between 9 am and 3 pm. CBD Energy is to distribute solar energy systems made by US based Westinghouse Solar Inc. This will enhance collaboration between the two companies prior to their merger, which subject to shareholder approval is expected to be finalized in the third quarter of 2012. CBD says the Westinghouse Solar technology involves fewer parts, faster installation, web-based system monitoring and enhanced energy collection. Shipping of the systems is also expected to commence in the third quarter of 2012. The companies' plan is for the systems to be assembled at CBD's solar panel manufacturing facility being established in south eastern Queensland. Westinghouse Solar (Nasdaq: WEST) was founded in 2001. In 2007 it pioneered the idea of integrating the racking, wiring and grounding directly into the solar panel. In 2009, the company introduced the first integrated AC solar panel, reducing the number of components for a rooftop solar installation by 80 per cent and lowering labor costs by 50 percent. The AC panel won the 2009 Popular Mechanics Breakthrough Award, and is the industry's most widely installed AC solar panel. Vmoto has placed 25,957,341 of the shortfall shares from its recent rights issue, raising another $311,488. This brings the total raised so far to $1,027,197. The remaining shortfall is up to 232,069,541 shares. WestSide Corporation said due diligence is continuing in relation to the indicative and conditional acquisition proposal received from Liquefied Natural Gas Ltd (LNG Ltd). "Parties associated with LNG Ltd continue to be active in their due diligence investigations. It remains uncertain whether the due diligence review will result in the submission of a binding acquisition proposal to the WestSide Board," it said. Meanwhile, WestSide's Meridian SeamGas gas field reached a gross production rate high during May of 14.5 terajoules a day (TJ/d) before excluding fuel gas. Dart Energy has been removal from S&P/ ASX 200 Index in the latest rebalance. Dart Energy has received government regulatory approvals to drill pilot wells at Fullerton Cove in PEL458 north east of Newcastle. The company has also secured land access agreements, and is negotiating a drilling rig. It expects to commence site preparation in coming weeks. Dart said the approval is a significant step for its business in Australia and its first Gas Sales Agreement (GSA) in NSW, with Maria's Farm Veggies Pty Ltd (MFV). The approval is from the Federal Department of Sustainability, Environment, Water, Population and Communities, the Independent Expert Scientific Committee on Coal Seam Gas (CSG) and Coal Mining and the NSW Department of Trade and Investment Regional Infrastructure and Services. The pilot wells will target the Borda and Medowie coal seams within the Tomago coal measures at depths between 650 and 700 metres using horizontal well drilling technology. Hydraulic fracturing will not be required, said Dart. Four lateral wells will each extend about 1,000 metres into the coal seams, giving a total of 4,000 metres of in-seam access to optimize gas drainage. Each lateral will intersect a single vertical well and gas will be produced from the vertical well. The approval is another step towards first gas to the Maria's Farm Veggies project as part of the GSA terms with MFV announced in December 2011. Dart has agreed to supply coal seam gas to produce heat and electricity for a state of the art $65 million glasshouse project being developed by MFV. The glasshouse will initially grow quality tomatoes, capsicums and cucumbers for sale and the initiative was recently recognized with the FutureGAS Innovation Award for 2012. A benefit of the proposed development is to show that coal seam gas and other land uses can co-exist. Algae.Tec has appointed Colin McGregor as General Manager Project Operations. Mr McGregor is an award winning project manager and manufacturing engineer with over 20 years aviation experience in the defense and commercial sectors, and recently headed a Fuel Efficiency Program for a major international carrier. He is also a multiple award recipient from the Australian Institute of Project Management. Executive chairman Roger Stroud said "His project engineering, fuel and biofuels experience plus his aviation background means he is the right person to roll out our global projects." AnaeCo is "probably in the best condition and position it has been in for a long time, as we approach completion of major technology and project milestone events, and the reality of commercialization becomes ever more visible," said managing director and chief executive officer, Patrick Kedemos, in a letter to shareholders. Mr Kedemos was commenting on three developments - a new $15 million funding initiative, the Western Metropolitan Regional Council (WMRC) DiCOM Expansion Project, and the business development pipeline. AnaeCo has begun a process to raise up to $15 million in new equity and has appointed corporate advisors in Hong-Kong, Singapore and Australia. "The appointment of Asian-based advisors has been a deliberate strategy to match the source of new equity capital with the emerging target markets of Asia for the DiCOM. technology," he said. AnaeCo has a $10 millon convertible loan facility with CF2 Pty Ltd, a company controlled by director and major shareholder, Dr Ian Campbell. The extent to which it draws on the CF2 loan facility will depend on the timing of the equity raising. "I am confident that, by the combination of these complimentary sources of funding, AnaeCo is fully funded to meet its objectives in the immediate and near term future," said Mr Kedemos. The WMRC DiCOM Expansion Project in Perth is in its final phase, with construction completion scheduled for September. "AnaeCo's team is gearing up to commence commissioning of the front end Materials Recovery Facility (MRF) at the earliest opportunity, with this planned to start in August." The project means the numerous parties who have expressed an interest in the DiCOM. technology can see it in operation. Mr Kedemos also said that the focus of commercialization will remain business development and generating sales. Priority targets in its pipeline are a project for Transpacific Cleanaway on the east coast that is being jointly evaluated; and a recently signed agreement with Dynagreen Environmental Protection Group Co Ltd to collaboratively exploit the DiCOM. technology in China and overseas. Dynagreen and its parent Beijing State-owned Assets Management Co Ltd (BSAM) are substantial organizations in the Chinese market, said Mr Kedemos. Other waste management companies and local government authorities in Australia and internationally have been following the progress of AnaeCo and DiCOM. "Many of these organizations have visited the WMRC Shenton Park project in the last six months, and they are openly considering how DiCOM. may apply to their business needs. Shares in Blue Energy fell to a five year low of 5.6 cents on 6 June. In an update, Blue Energy said the Sapphire 4 Pilot Production Test well that was drilled in late 2011 is now being completed for extended production testing. The Monslatt 7 pilot well is expected to return to gas production shortly. Monslatt 5P was returned to production. The Monslatt 6P well is shut-in for an extended reservoir pressure build-up which will be used to evaluate reservoir properties. The Monslatt 4 well will soon be put on test. The Monslatt 9 well can be is completed and is a rig and additional Governmental approvals. Shares in Cell Aquaculture fell to a new all time low of 1.9 cents on 7 June. In a market update, the company said that funds from La Jolla Cove Investors are no longer being drawn and it is working to finalize the arrangements with them. On 14 May Cell Aquaculture finalized an agreement with Singapore company Straits Consultancy Pte Ltd that saw Straits pay Cell Aquaculture $600,000 in return for 30 million shares that are escrowed for twelve months. The capital injection can be increased subject to Straits' approval for its use. In other strategic changes, Cell Aquaculture will no longer be an investor in "Hatch to Dispatch" facilities. The company will undertake the consultation and construction of projects involved in all aspects of the Hatch to Dispatch concept. It will continue to operate the Thailand retrofit facility in the short term which will enable it to produce Australian bred barramundi for sale in its retail operations. Discussions are in progress on Cell Aquaculture's agreements with the State of Terengganu and it hopes to finalize these in the next six months. Cell Aquaculture will expand its Perth based food business to Malaysia and the eastern states. The expansion will commence immediately and will include both seafood and dairy products. Marketing activities and expenditure on past projects will be assessed and controlled over the next six months. European Gas may delist from the ASX, following a proposed selective buy-back of its shares. The company is offering to buy its shares in exchange for shares in its subsidiary, European Gas Ltd, a private unlisted company incorporated in England and Wales. EGL UK is the operating subsidiary of European Gas that controls all of the exploration assets of European Gas in Europe. The company said it needs to attract significant investment for a more extensive drilling campaign. "Given that all of the assets of the Group (apart from the Buru Royalty stream), the management team, all the employees, a large number of beneficial holders of European Gas shares and investment banks - interested in supporting EGL - are in Europe and the difficulties previously encountered to raise enough capital in the Australian market to develop our projects, the board believes that future funding will most likely be available and on better terms from European investors through a European vehicle," it said. Shareholders who do not accept the offer or are not eligible to participate will remain shareholders of European Gas. 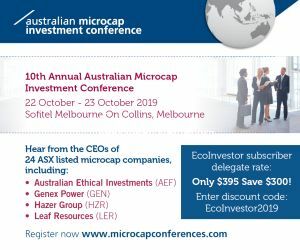 However, depending on the level of acceptances for the buy-back, the company may delist from the ASX if it cannot meet minimum spread requirements. Greenearth Energy and its Israeli joint venture company, NewCO2Fuels Ltd, say that they have made progress in developing an industrial scale solar powered technology to reduce carbon dioxide emissions from brown coal. The technology, being developed by professor Jacob Karni and his group at the Weitzman Institute of Science in Israel, uses concentrated solar energy to dissociate carbon dioxide (CO2) to carbon monoxide (CO) and oxygen (O2). The same system can also dissociate water (H2O) to hydrogen (H2) and oxygen (O2), at the same time. The CO, or the mixture of CO and H2, the Syngas, can be used as gaseous fuel for power plants or converted to liquid fuel such as methanol. NewCO2Fuels is now building a solar reactor for the conversion of CO2 on an industrial scale. Greenearth managing director Mark Miller said "We are delighted with the progress being made by our Israel based technology partners and believe that our laboratory proven CO2 to Fuel conversion technology has the potential to further utilize our State's vast brown coal resources into the future." In an update on its planned LNG project at Fisherman's Landing in Gladstone, Qld, Liquefied Natural Gas (LNG) says that the lease agreement for the site has been extended to 31 December 2012. The agreement specifies the conditions, including the procurement of gas supply for the LNG Project, which are required to be satisfied by 31 December, after which its subsidiary Gladstone LNG Pty Ltd will have another six months to satisfy any remaining conditions. These primarily relate to obtaining approvals to recommence construction of the LNG Project. Subject to satisfying the conditions and government approvals, Gladstone LNG Pty Ltd will have a 30 year lease over the site. LNG said that with the support of its major shareholder China Huanqiu Contracting & Engineering Corporation (HQC) and its controlling shareholder, China National Petroleum Corporation, is advancing agreements with gas suppliers. In this regard, they are continuing their due diligence and discussions with Westside Corporation about their proposed takeover of the company. Shares in MediVac are back to their all time low of 0.5 cents. La Jolla Cove Investors has converted another 6 million shares. 3 million shares were at 0.56 cents, giving MediVac $15,600 and another 3 million were at 0.5 cents, giving MediVac $15,000.